Want a great looking smile? Are you self-conscious about the way your teeth look when you’re taking pictures? Studies show that a sizable number of us conceal our teeth when we’re having our photos taken because we’re embarrassed over the yellow state of our teeth. Having white teeth is important to us, that’s why at Todd Franklin, we offer teeth whitening to the residents of Lodi so that the dream of sparklingly white teeth can become reality for you. So why does teeth become yellow? The sad reality is that, for some people, how matter how good their brushing habits are, their teeth are stained and yellowing. But why is this? There are multiple reasons. Some of them can be due to aging, but often times it can be due to poor eating habits. Certain foods, such as coffee, red wine, and sugar, or habits like smoking, can stain your teeth and thin enamel, leading further to yellowing teeth. However, this doesn’t mean that yellow teeth is necessarily unhealthy, but developing habits that keep your teeth white also help keep your teeth healthy. These habits involve regular brushing after eating and drinking to clean away staining foods or enamel eroding acids before they do damage to your teeth. 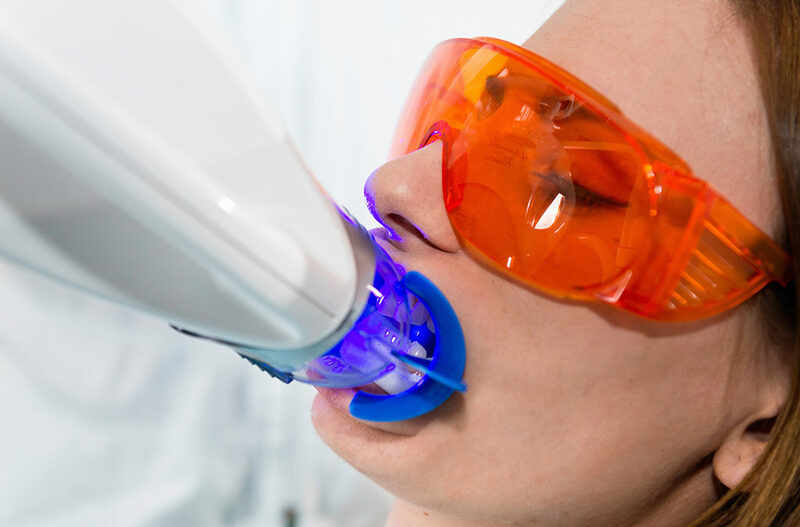 What is the method for teeth whitening? Regardless of your eating habits, if you’re looking for a way to get sparkling teeth quickly, then teeth whitening at your local Lodi dentist could be an option. When you come in for whitening, we’ll apply a bleaching gel to your teeth in order to improve its color. This whitening procedure can be done in-office or at home. In-office whitening allows us to use a stronger whitening gel. Depending on the state of your teeth, sometimes it is necessary to continue the whitening procedure at home. If your teeth are less that completely white, don’t fret. Stop by Todd Franklin’s dental practice in Lodi for solutions that will leave your teeth dazzlingly white.